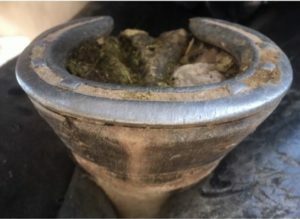 When you understand the hoof as a complex, flexible, living structure and then consider a shoe as a rigid cast, it’s easier to imagine what the rest of the horse must do to compensate for the lack of movement within the hoof capsule. I firmly believe that humans interfere with a horse’s inherent suppleness. To show you what I mean, here is the right front foot of a 6-year-old paint with lameness issues after I pulled her shoes to set her up to go bare. If you look closely at the second and third photos you can see that the live sole has a flat bottom, the walls are flared and the frog is narrow. The sole is spread and the frog is pinched. 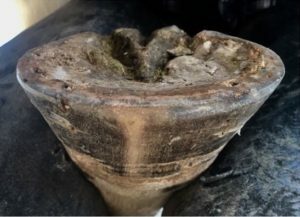 This is caused by the fixed portion of the solar aspect of the hoof capsule spreading out over the steel shoe and the horse’s weight pushing the coffin bone through the bars of the shoe. This action has a reaction. 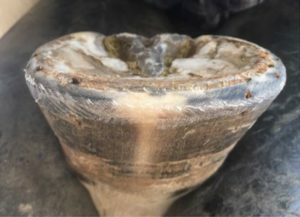 Due to the conical shape of the hoof capsules thick hard horn, the spreading of the toe at the bottom causes the narrower top and back of the hoof capsule to contract. This squeezes the soft tissue under the coronary band and the frog like cake icing in a piping bag. The next step for some practitioners would be to apply a plastic pad between the sole and the shoe to provide a stopping mechanism. This may bring temporary relief but the reaction to this is even more spreading, squeezing, and sole depletion. The foot loses all ability to grip the ground. 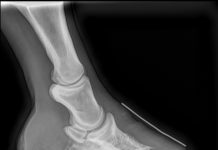 The first time I heard the term “gripping” used for a function of the horse’s hoof was in a blog written by Dr. Teskey. It didn’t change the way I trim, it just added more insight to my understanding of Jaime Jackson’s description of the steel shoe as a deleterious rigid cast. The real remedy is to pull the shoe and give the foot a chance to get a grip on the ground. This can be difficult when a horse has depleted soles and a shriveled-up frog. 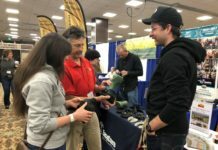 Simply pulling shoes can be a death sentence and only addressing the toes can create a long, painful, and unsuccessful attempt at restoration. After pulling shoes this mare was released from her stall, turned out with a herd in an arena, and put on a 2- to 3-week trim schedule. The horse’s hoof has the ability to support the horse’s weight on its own if the shape is physiologically correct. 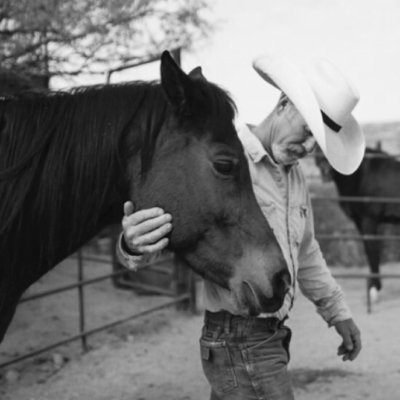 When movement is encouraged on a comfortable, supportive, and abrasive footing like sand the horse can begin to get a grip. When the structures have been properly developed over time, their grip gets stronger. Two months later, she still has body stiffness, but she’s regularly turned out with a small herd in a large arena and she’s being ridden lightly. Here’s a photo of the right front foot post trim. 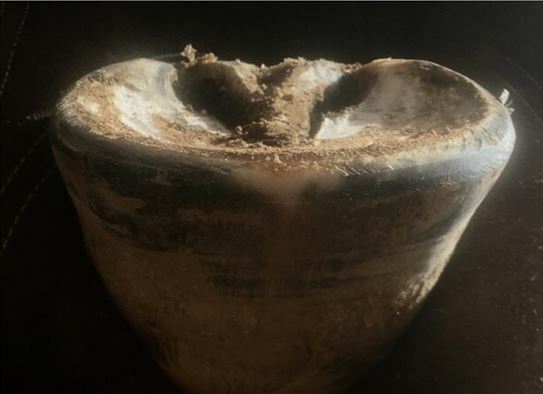 You can see that the live sole has a true bowl, the walls are more upright (without top dressing) and the frog is no longer being pinched. This foot is relaxed and ready to grip. Next articleOpen Nailing Slots – Why Are They Important? Thanks, always informative. Sometimes I have taken my barefoot horse over large rock formation where a steel-shod could not go. I think of a mountain goat squeezing its dual hoofs together to get a firm grip on the rock.